In today’s digital information age, the amount of information and data we have can be a double-edged sword. On the one hand, we have access to almost any information at any time. But on the other, it can be challenging to filter through it all to find exactly what we need. The same is true in L&D when curating elearning courses for your learners. We often hear from organizations like yours that the time it takes to find, curate, and deploy courses in your LMS can be enormous. This is why we’re so excited about OpenSesame Smart Lists—leveraging machine learning for content curation, it’s built specifically to help you create lists of courses on one or multiple training topics specific to your organization. 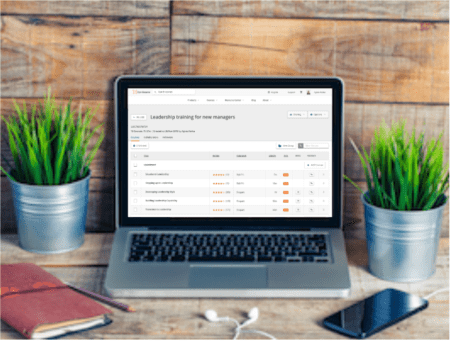 Smart Lists use a powerful algorithm including your prior course selections, course completions, and learner ratings, combined with an intuitive list builder to recommend courses that fit your training needs. Using Smart Lists is easy—and fast. Log into your OpenSesame account and select My Lists from your account menu in the top right corner. If you’ve used OpenSesame Lists, you’ll see your existing Lists. To quickly find new course recommendations, simply click New Smart List. Next, provide your preferences for training topics, language, seat time, and if you prefer courses in the OpenSesame Plus subscription. You can create your course list from here by clicking Create your list, or choose advanced options to select specific publishers, course features, and if you prefer new courses. Your course recommendations will be presented in a new List with each training topic organized in a separate group with the top five courses each. For easy organization and tracking, the List title defaults to the date it was created, which you can edit, along with the description. As with other Lists you’ve created yourself, you can share them with your stakeholders to collaborate, give and receive feedback, preview course demos, and add all or selected courses to your LMS. To further save you time curating courses for your learners, we’ve also added Smart Groups—a quick way to add courses to Smart Lists or lists you create yourself. To search for and add additional courses to an existing List, simply click Add Courses located next to the course group. With the Smart Groups panel, you can browse additional course recommendations for the selected group. The courses displayed are based upon the keyword (group name) and the recommendation algorithm tailored to your organization’s preferences. You can change the keyword or set a variety of filters to further refine your results, including seat time, languages, course features, publishers, new or mobile-ready courses, and those available in the OpenSesame Plus subscription. See a course you like? Add it to the List by clicking on the Add to list icon. Once you’ve created and refined your course list, you can easily add it to your LMS and deploy it to your learners.